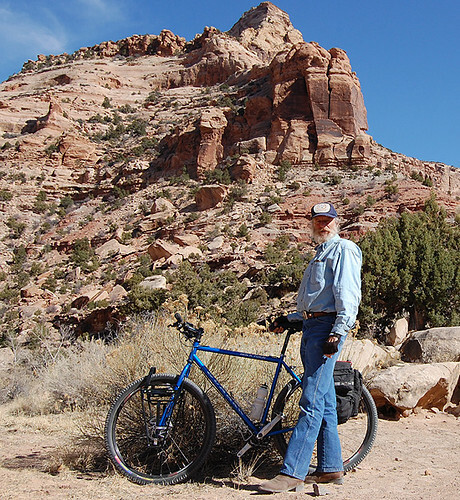 John M. uses his Rock Tour to explore central Utah, shown here near the San Raphael Swell. It's a 22 inch 29er in Gunnar Blue. John M. shows off his Rock Tour, shown here near the San Raphael Swell in central Utah. It's a 22 inch 29er in Gunnar Blue. 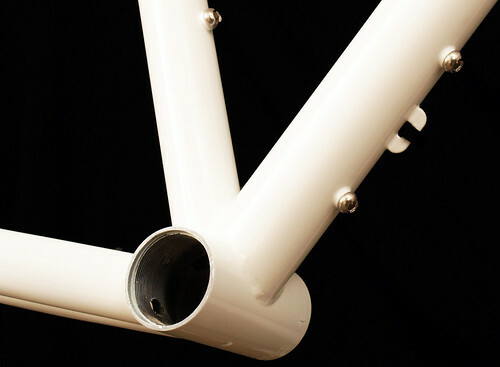 Head tube on Gunnar Rock Tour in White with Black Bullseye Decals. Beefy gussets help you handle tough terrain with confidence. 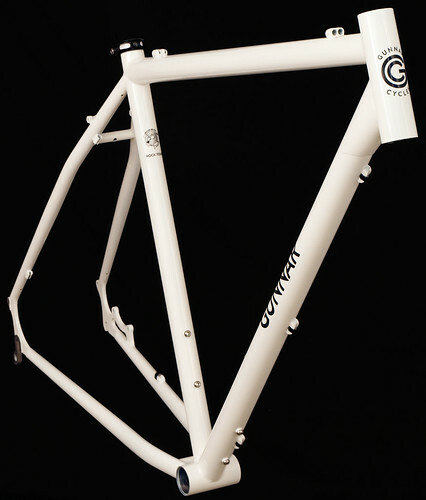 Bottom bracket view of Gunnar Rock Tour in White with Black Bullseye Decals. 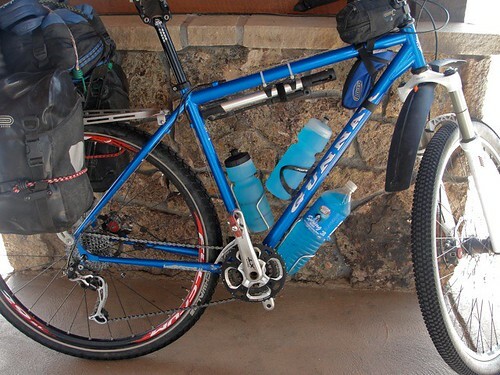 Heed the call of Adventure with a terrific bike for the outback. Heed the call of Adventure with a terrific bike for the outback. 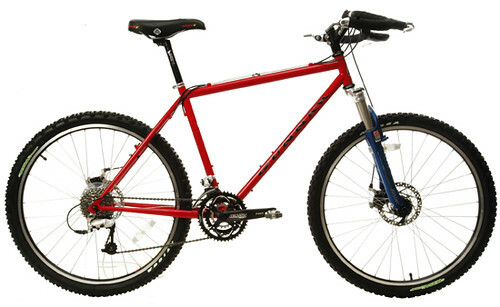 Easy fit, chainstay disc mounts, rack and fender eyelets let you answer the call of the wild. Learn more . . .
Front view of Gunnar Rock Tour in White with Black Bullseye Decals. Heed the call of Adventure with a terrific bike for the outback. 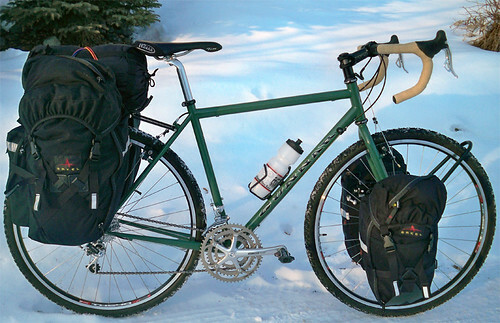 Easy fit, chainstay disc mounts, rack and fender eyelets let you answer the call of the wild. Gunnar Rock Tour 29er on a Banff to Mexico Tour on the Great Divide Trail. 58906. 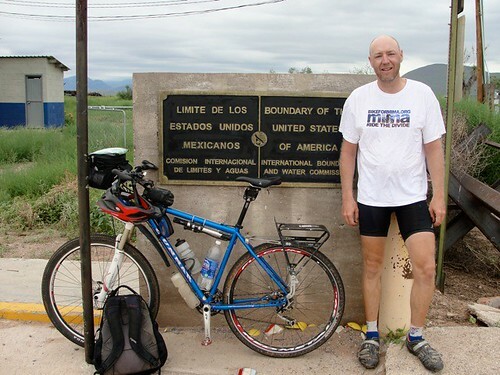 At the Mexican Border. Gunnar Rock Tour 29er on a Banff to Mexico Tour on the Great Divide Trail. 58906. Bike portrait. When mountain biking was climbing Pearl Pass or discovering Mount Tam, it was all about adventure not competition. 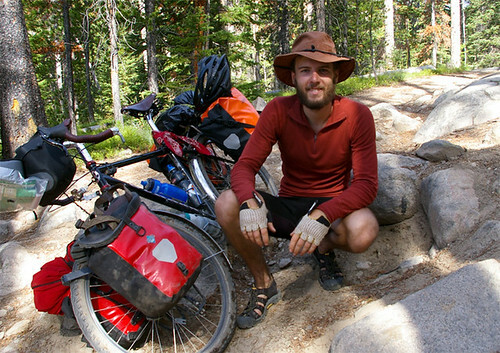 So when the Adventure Cycling Association opened the Great Divide Trail, we decided to build the perfect bike for the explorer. We mixed in some old school goodness with some leading edge features. With a shorter top tube than our race designs, you can enjoy a more comfy, upright fit for all day exploration. 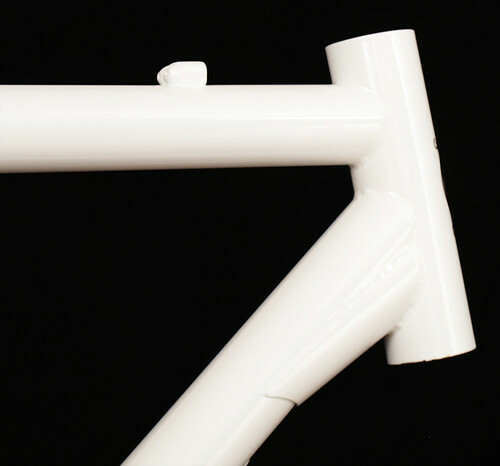 Our leading edge chainstay disc mounts let you mount a rear rack without interfering with the disc brakes (chainstay disc mounts are available only on sizes 16″ and up). And disc brakes make your life a lot easier in the mountains. No more overheating your rims on controlled descents. Plus, you get lots of tire clearance whether for 26 inch wheels or our no-extra-charge 29er designs. 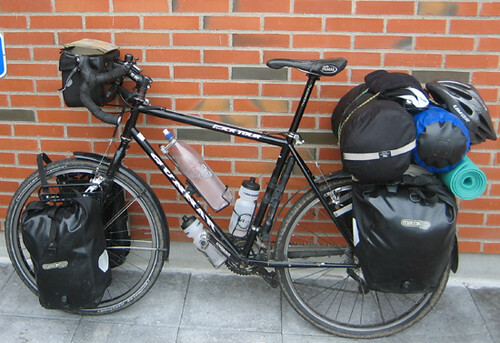 Rack mounts and triple water bottle boss sets give you lots of ways to secure your cargo. Our head tube gusset system adds strength and provides excellent fork clearance, whether you go rigid or mount today’s suspension forks. Have special needs and interests? 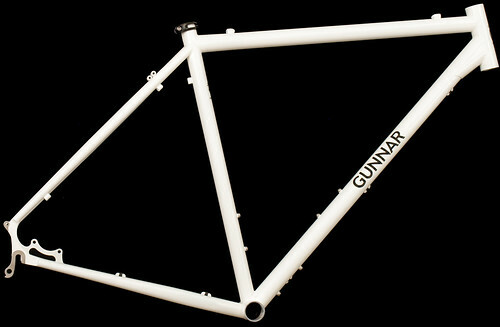 Gunnar offers a wide range of paint and frame options. When the need for custom fit is called for, you can take advantage of our “Made to Measure” version. With our Made to Measure service, you can also order horizontal dropouts for single speed riding, with either 120mm (fixed gear) or 135mm (single speed) rear dropout spacing. You can also order Paragon’s Slider or Rocker dropouts, which make it easy to convert your frame to disc brakes, single speed, hub-transmission and a host of other possibilities. We also offer a convertable package, where we add braze-ons for derailleur drive trains to go with the slider/rocker dropouts. Finally, you can order a version designed for the Rohloff 14-speed rear hub. Your shop can get you the matching fork. 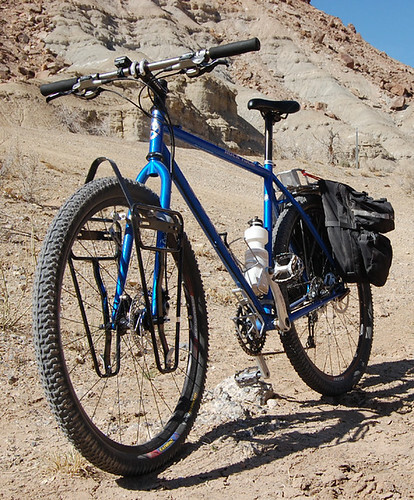 Surly makes a an appropriate fork, the Troll for 26″ wheels. The Rock Tour comes in several stock colors, with base options changing from month to month. For other ideas, check out our Archived Colors. Recent colors of the month are available for a nominal charge. You can customize colors with a wide range of options, including one-step, two step and special effects colors. When the wilds call, the Rock Tour can take you there. 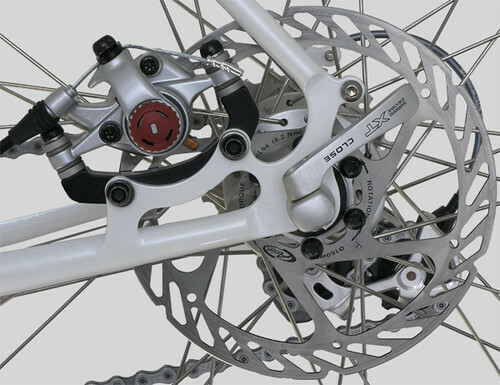 The 13.5″ size comes with seatstay disc mounts.